Raw recipes offer a lot of creative ways to transform unprocessed fresh, crunchy plant foods into forms we all love. For example. grabbing an apple makes a great snack, but blending it with a banana, almond milk, and a mango, offers something completely new—a smoothie. In a similar way, experimenting with a food processor will help you to make wonderful dips, dressings, soups, pâtés, and tasty desserts entirely out of health foods without baking or using heat. We'll show you how to make a cookie that will keep bodies and the kitchen cool on these hot summer days! You've probably heard quite a bit about raw foodism over the years, which has become on trend in many places, making a name for itself through trendy raw bars and juice shops. As part of a vegan diet, eating raw is a practice in consuming uncooked, unprocessed raw plant foods. While I personally am not a raw foodist and eat a variety of cooked plant foods, raw foods are part of all of our diets, and eating raw can be the simplest way to consume more fruits, vegetables, nuts, seeds, sprouted grains, and legumes. Nutritionist and author of Choosing Raw , Gena Hamshaw, C.C.N., has a great recipe for raw cupcakes , which I have slightly modified to make a no-bake raw vegan cookie. Scott, my professional taste tester, campaigned for me to call these "Goo Balls of Goodness." I was out to make a cookie, but got more of a cookie dough. If you, like me, always tried to swipe some cookie dough before baking, you'll love licking the spoon here. My Mom hated when I did this as a kid because of the raw eggs, but with this vegan, egg-free recipe, there is no risk of food poisoning! Take 2 large whole carrots, wash and peel the outer layer, and cut off the top and the bottom just as you would prepare to eat raw or put in a stew. Grate using a grater tool or just the peeler; measure out 2 cups, and set aside. Slice dates with a small paring knife and pull out the pits (which you can discard or compost). 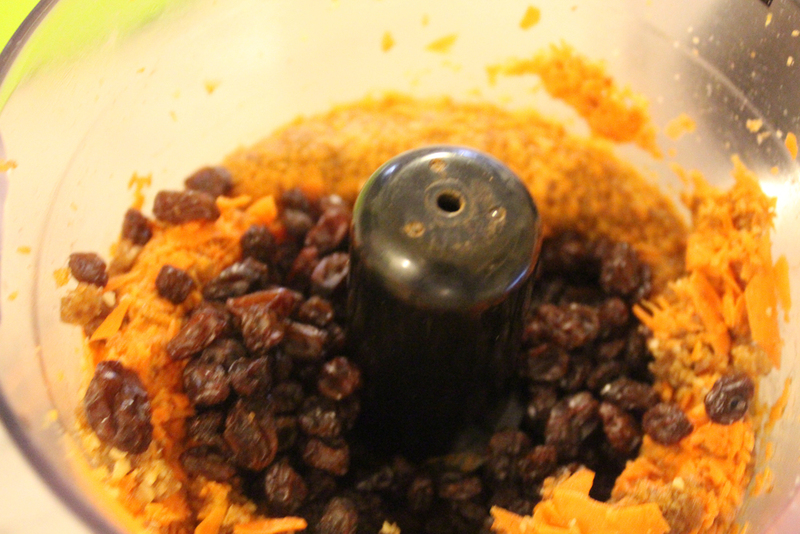 Using a food processor, such as the Oster Versa Performance Blender, process the dates and the walnuts (which do not need to be soaked prior, unless you care to do so) until crumbly. Add the grated carrots and spices. The moisture from the carrots will help make the “dough.” If you are looking for a drier mixture, try to extract moisture from the carrots using a towel, however, I skipped this step and made more “gooey” cookies. Pulse in the raisins. A thorough process will smoothly incorporate raisins, while a quick pulse will give you visible raisins, mimicking the look of raisins added to batter, such as in traditional oatmeal cookies. With clean hands, scoop out the dough using a teaspoon and roll into small bite-sized balls. Put on a plate and put in the freezer for ½ hour to set. Store in the refrigerator between servings. All foods in this recipe are fresh, whole, simple foods, that you may even already have at home. Buy shredded carrots or grate with a grater or peeler, as I did here. Try to remove as much moisture as possible. A beauty shot of these softer nuts, walnuts, which are great for heart health. Medjool dates are rich in many essential nutrients and especially high in potassium. I don't think anything in nature is naturally sweeter. I love adding dates to treats. Adding raisins to cookie dough is an old favorite. Think oatmeal raisin cookies. This dough is just as tasty, and far better for vitality and energy. Toss in the walnuts and the dates (after the pitts have been removed). It's so satisfying to see the ingredients to come together as they should. Here we go to dough! Add the carrots for more nutirients, taste, and that lovely color. Blend smooth, or pulse quickly to get the spotted look. Shape and roll as if to load into the oven, but wait, these are raw, so put them into the fridge or freezer for a bit to set. Enjoy and share these wonderful cookies, which go great with a glass of unsweetened coconut milk! I really cannot prepare you for the deliciousness of these sweet, energizing desserts. As the summer continues to heat up, no bake food options become more desirable, making this a great time of year to try more cooling, raw fresh fruits and vegetables. Make your own raw treat and share it with us below or by tweeting @forkfuloflove or on Instagram. Baked Potato Pizza: Celebrate Carbs!